With Father's Day just around the corner, I made this card from snippets lying on my table. The kaisercraft die-cut stag and shimmery mat beneath it were from a previous card I made that I just wasn't crazy about, so I carefully cut that panel from the card and re-purposed it here. I placed it on a gray Recollections piece of dsp, cutting with a Lil Inker stitched rectangle die set- which was used on the image panel and cardstock base as well. The blue sentiment panel was heat-embossed with white ep using a MFP stamp, and I die-cut that with a Crealies Text Tag die. I attached it with 2 white mini brads. The word "For" was done with a SNSS stamp on white and fussy cut. The card base is heavy royal blue, purchased from a local store. Simon Wednesday challenge which is to use more than one stamp. Thanks for stopping by and make it a great day! Great Father's Day card! Great colors, also. Don't we have the best scraps laying, sometimes? Love that royal blue card. Well done Carol! 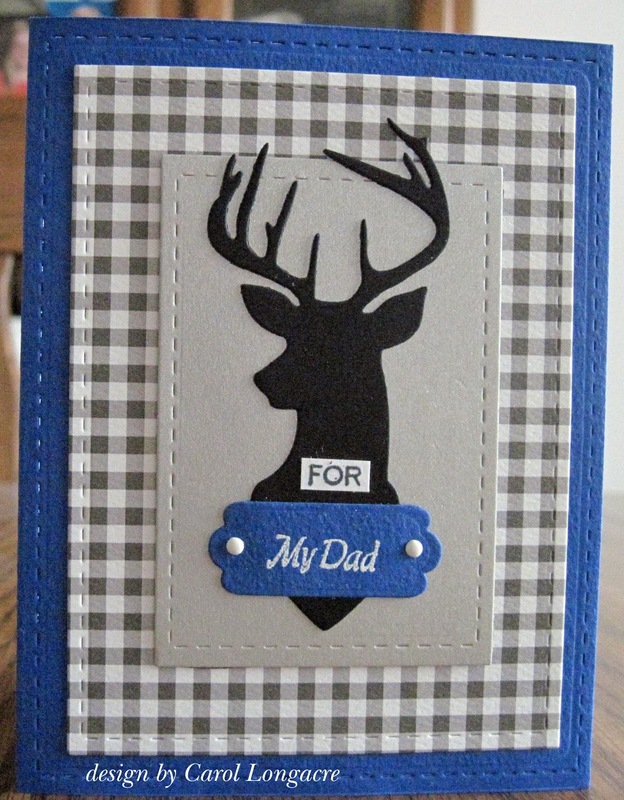 Great re-purposing of the stag and his mat, love the combo with that blue tone, I think is just perfect for men! Lovely tag and gingham paper! You already know how much I LOVE this I'm sure! The plaid paper looks great with the deer. Great card for a guy! A super card Carol, a fabulous masculine design. Super card Carol, very masculine. That is a great card for a dad. I love the design and color choices. Nice job repurposing card bits! Thanks for playing over at the house that stamps built. Great masculine card! I love the layers and colors you used! Thanks so much for linking up to The House That Stamps Built! Fabulous masculine card!! Love the checks with the stag silhouette; perfect combination! Thanks for playing with The House That Stamps Built. Very nice masculine card! Your are the SNIPPET queen! This is a perfect masculine. I love the grey gingham paper! Thank you for joining us for Simon Says Stamp's more than one stamp challenge! Good Luck!